As something small enough to go unnoticed in nearly all of its uses, a gasket remains one of the most vital components in some of the world’s most complicated and important mechanisms. Existing in virtually every size, shape and design imaginable, gaskets are compressed between two adjoining materials to create a seal and compensate for surfaces unable to seal shut on their own. Gaskets can be as basic as the rubber O-ring found in a garden hose, as prevalent as the head gasket in cars and trucks, or as crucial as intermediaries in fuel and cooling systems for aeronautics. These mighty little products can be made out of many materials, depending on what their end-use will be. 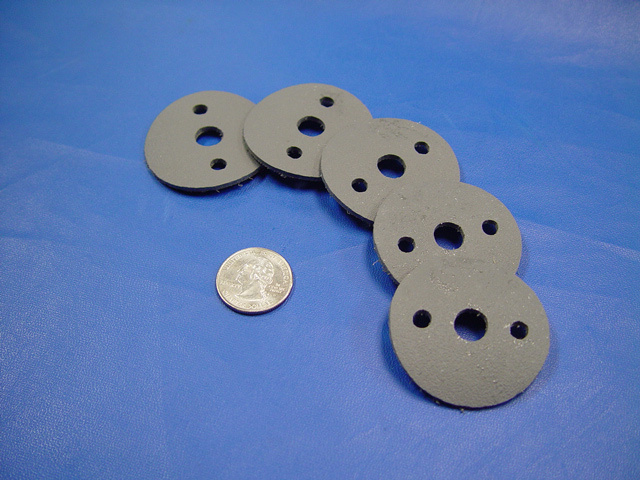 One material they are often made of is foam, and with their manufacturing capabilities and product selection, The Foam Factory is the right choice for manufacturing foam gaskets on any scale, large or small. Most often made of closed-cell foam, foam gaskets of this variety are able to resist the transmission of air and fluid. Open-cell foam, while unable to form a pressure seal because of its cellular structure being fully interconnected, can however be used in applications where some permeability is desired. 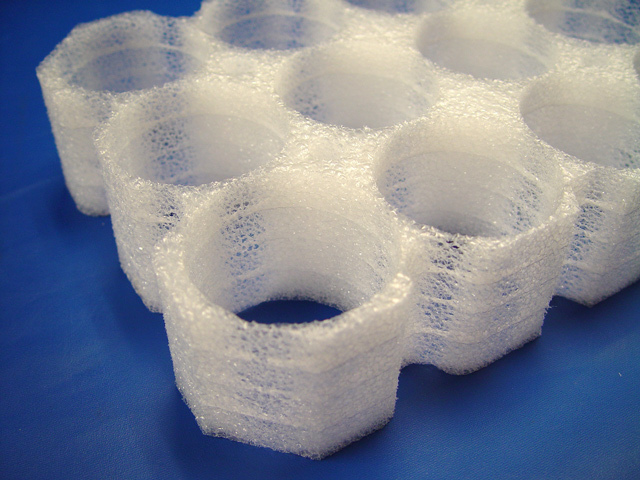 With their light weights and durability, cross-linked polyethylene (XLPE) and neoprene are the most frequently utilized closed-cell foams for gaskets. Polyethylene foam is also occasionally used, as is polyethylene foam roll because of its flexibility. Possibly the greatest benefit of a foam gasket however, may be its value. When compared to rubber, metal and silicone, foam and foam rubber gaskets can provide the necessary performance at a price much lower than other materials. Because of its unique molecular structure, neoprene is the most popular foam material for use in gaskets. With softness and flexibility that allows it to be compressed between two components, it remains strong enough to hold the seal, while resisting Ozone, many chemicals, sunlight, oxidation and many petroleum derivatives, in addition to air and water. This utility spectrum makes it a fantastic product for creating a low-pressure gasket seal that, ideally, is rarely replaced. Uses for neoprene gaskets include seals in air conditioning systems, air filter gaskets, livewells for fishing and applications where gasoline and oil are in contact with the gasket. XLPE is similar to neoprene in terms of physical properties and potential uses, but is particularly useful for gaskets that require greater thicknesses. Extremely fine-celled, nontoxic and free of CFCs, HCFCs and hydrocarbon blowing agents, XLPE is excellent in applications when maintaining absolute continuity and purity of the substance passing through the gasket is a concern. Another useful quality of XLPE gaskets is its color spectrum. Made in yellow, purple, blue, green, red, black and white, specific gaskets can be color coded to their unique purpose. This is very helpful in situations where a company uses multiple kinds of machinery with multiple gasket types of similar shape and size. Color coding a particular type of gasket to a certain machine or part can help workers make sure the right type is always used, greatly reducing the chances of damage to machinery or the product being produced. If machine A always uses blue gaskets and machine B always uses yellow, they will not be easily interchanged. A popular construction material, polyethylene foam is frequently used as thermal gaskets for assisting in the insulation of homes. One of its most important applications is the sill plate gasket in homes and buildings, located between the foundation and the lumber sill plate that supports the stud wall beams. Sliced into very thin sheets, these insulation gaskets form a seal between the rigid concrete and wood sections to prevent moisture, air and insects from entering the structure. Another construction use of polyethylene is expansion joint filler in masonry. When placed between slabs of concrete, these thin cylinders reduce the amount of sealing material that must be poured while allowing the masonry to maintain a degree of flexibility. Polyethylene foam performs well in low temperatures and in low-pressure gasket applications as well. The Foam Factory’s fleet of cutting and pressing machines allows them to efficiently manufacture short-run and bulk projects. Their waterjet cutter is computer programmed to create precision cut materials, with its .005 inch stream of water, pressurized at 60,000 psi. Crisp angles and smooth edges can be created with this machine to create a custom gasket that will make for a perfect seal. For large or bulk orders, The Foam Factory’s die cutter can produce hundreds of thousands of products in minimal time by using a stamping process that generates many identical pieces in a single pressing. Dies, also known as plates, are inset with very thin metal blades so that when the foam is compressed by the machine, the result is a precision shape that perfectly matches the desired design. Dies are optimized to create the maximum number of products per pressing, based on the size of the machine and the number of products to be created. Multiple designs can be included on a single plate and multiple plates can be placed on the pressing table at one time. As an example, The Foam Factory can produce 30 O-rings, measuring a sizable 6 inches in diameter, in one stamping. Once the stamped product and scrap foam is removed from the dies, a new sheet is placed in the machine and the process repeats, taking only minutes. If you only need one or two gaskets for a simple after-work project or need 100,000 to be used in a new product your company is offering, The Foam Factory will earn your “seal” of approval by getting you exactly what you need at an excellent value.